Traditionally, the history of the birth control movement has been told through the accounts of the leaders, organizations, and legislation that shaped the campaign. Recently, historians have begun examining the cultural work of printed media, including newspapers, magazines, and even novels in fostering support for the cause. 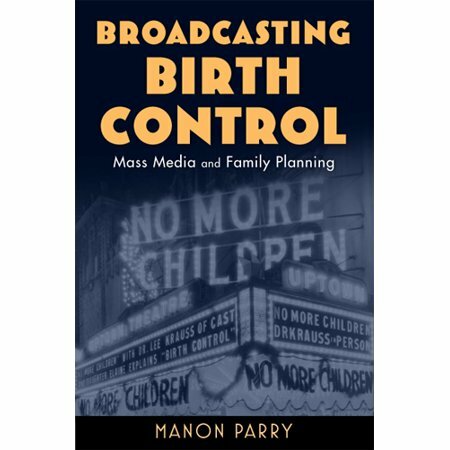 Broadcasting Birth Control builds on this new scholarship to explore the films and radio and television broadcasts developed by twentieth-century birth control advocates to promote family planning at home in the United States, and in the expanding international arena of population control. Mass media was critical to the birth control movement’s attempts to build support and later to publicize the idea of fertility control and the availability of contraceptive services in the United States and around the world. Though these public efforts in advertising and education were undertaken initially by leading advocates, including Margaret Sanger, increasingly a growing class of public communications experts took on the role, mimicking the efforts of commercial advertisers to promote health and contraception in short plays, cartoons, films, and soap operas. In this way, they made a private subject—fertility control—appropriate for public discussion. Parry examines these trends to shed light on the contested nature of the motivations of birth control advocates. Acknowledging that supporters of contraception were not always motivated by the best interests of individual women, Parry concludes that family planning advocates were nonetheless convinced of women’s desire for contraception and highly aware of the ethical issues involved in the use of the media to inform and persuade. €315,000 research project studying the social relevance of medical museums, culminating in a book and exhibition at Special Collections, University of Amsterdam. While the collections of medical museums, including human remains, are sometimes labeled as “curiosities,” the title refers instead to the idea that it is entirely human to be curious about bodies and that curators can harness that interest in socially-useful ways. However, stakeholders at medical museums disagree on the role of their institutions in contemporary society, on the capacity of audiences to understand complex or sensitive medical issues, and on the most effective exhibition strategies. This project analyzes current medical museum exhibition strategies to identify dominant narratives as well as marginalized histories, and investigate their implications for health and wellbeing. The focus includes four areas where medical museums could make a significant impact: mental health, infectious diseases, sexuality/reproduction, and bodies of difference (addressing race and disability). This research is of direct relevance to museum practitioners, and is therefore being developed in collaboration with medical museums. Project output includes a Heritage Lab demonstrating interpretive strategies for medical heritage, an online tool for museums and their audiences, as well as an open access journal article and a book. The project will provide the first detailed analysis of exhibition strategies across a range of European medical museums, and the first in-depth study to specifically consider the role of medical museums in promoting health and wellbeing.